Bradley Willoughby is a 16 year old boy from Queensland, Australia. He loves riding his motorbike around his parents’ farm. Riding bikes can lead to accidents, which can be very lethal. 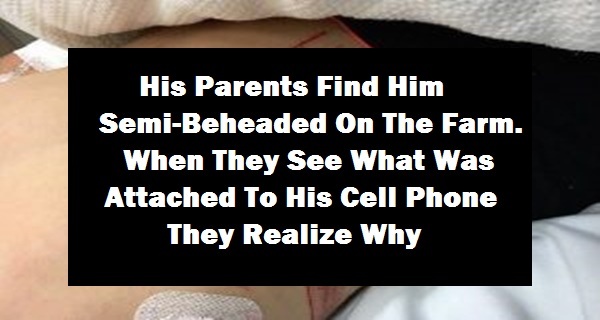 However, when Bradley had an accident, his life was endangered by a simple phone accessory that most of us carry with our phones. Bradley liked to listen to music while he was riding his bike. So, his headphones were usually in his ears while he was doing it. He had an accident because the throttle of his bike got stuck, which made him jump into a barbed wire fence which was around the farm. He had a couple of injuries and wounds, one on his stomach and he dislocated his ankle. They were bad, but the worst thing was that his headphones snagged on the barbed wire, and since they were jammed in the helmet, they stayed connected to it. The copper wires were incredibly strong, which almost decapitated him. As a result, Bradley’s father took the wires off his throat while the ambulance was on the way. His mother said that Bradley was very careful when he rode the bike and nobody ever thought that something so simple like the headphones could put his life on the line. So, reading this story, many bike riders will be warned about the dangers listening to music while on the motorbike possesses. There are other reasons why having headphones in your ears can be dangerous while riding the bike. For example, you won’t be able to hear well what’s going on around you, so if another vehicle approaches you, you might not even notice it. Bradley’s story should be a warning, since now he has a couple of months to recover from the wounds. Also, he’s very fortunate to have survived. We hope you learn something from his accident.